Influential Funk-Soul-Rap & Black Music band from Santiago, Chile. One of the first that offered a really exciting blend of african & caribbean Black rhythms (Reggae), as well us-american black music (Rap, Soul, Funk, New Jack Swing, Hip-Hop, etc.) with their well known southamerican black roots sounds (Brasilean music, MPB, candombe, etc.). Active since the last years of the 80s till today. All around the figure of their leader and mentor, Pedro Foncea, singer and former this band. 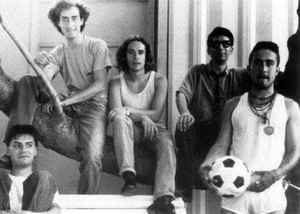 Old members were also Igor Saavedra, Celso Barria, Sidney Fernández, Matías Lara (ex-Los Barracos), Eduardo Correa, Alonso Cabezas and Silbert among others.